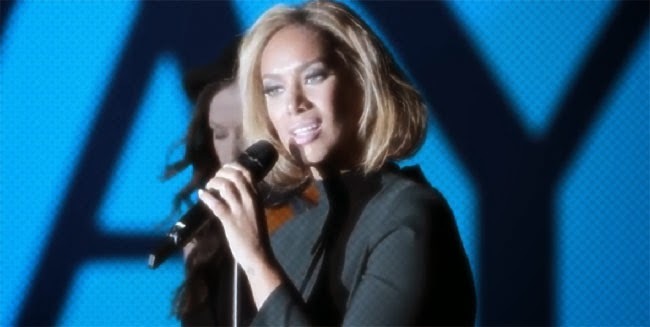 Diva Devotee: [New Music] Leona Lewis Serves Up Operatic Vocals On "Ave Maria"
[New Music] Leona Lewis Serves Up Operatic Vocals On "Ave Maria"
Fine, so it's not legitimately "operatic"- more a faux-classical sound- but it does allow us to hear some of the classical training Leona Lewis received as a youngster put to use. It's not a style of singing we hear often from the X-Factor winner, but it's certainly a direction she should consider venturing into if the pop career fails to reignite. Sang over a simple piano accompaniment, the Diva's take on Ave Maria shows off Leona's effortless head-voice, beautifully. There is a little too much reverb on the vocal for my liking, however I can appreciate that it does add to the ethereal/Churchy feel of the Schubert classic. Ave Maria is taken from the Diva's Christmas album, Christmas, With Love, which was released on the 29 November. I am reserving any and all judgment until I hear her sing this live. I've always found this aria to be dull and boring, putting Leona's voice behind the track has only increased this sentiment tenfold. I was asleep by the minute mark. I love hearing her voice in a different light. Its really hard to believe this is the same girl who wobbles over pop tunes. I'm not sure it can really be considered an aria, it is really more of an art song or lieder, to be honest. I heard it and I quite liked it, I think - for a pop singer - it is pretty decent. Is the rest of the album any good? I liked her "Silent Night" but is the rest of the album worth buying? Are there any awesome vocals I should check out? Let's wait until she's 71 and can still sing it? Seeing as Leona is far from 71, I fail to see your point? Mine was a bit of a tongue in cheek response to DD's lines " a direction she should consider venturing into if the pop career fails to reignite". I say "tongue in cheek" because I don't think DD was suggesting Leona to consider opera or even in seriousness faux-classical. I took his to be a tongue in cheek remark and responded in similar fashion. Renee Fleming is simply one of the many famous classical singers who sang the tune and one whose live video was easily found on youtube. And the joke went to opera singers of today being not worried about future competition from Leona. I don't think a 71 year old who likely is only known by real opera buffs is in the same category of today's famous classical singers I was referring to. Not even mentioning the fact that Bogna here is singing Gounod's Ave Maria. And entirely different piece of music. I suggest next time you want to plug your favorite..simply post a comment in and by itself instead of making a nonsensical reply. And besides all that...I found your video to not even be close to the level of Renee tbh. But I have to add again...I am not an opera buff and therefor mine is but an opinion based on how my ears felt after hearing it. Not any official operatic knowledge. Most songs are up on youtube. Personally ....I wouldn't waste your money. You want to get a great christmas album? Get Shelby Lynne's album from 2010. You have way too much time on your hands sir. her voice sounds robotic. She's shitting on a classic. Shame! She sings Loved me back to life chorus in a higher key, also sings Titanic and does so well. Listening to this and I am more confident with the fact that she is a mezzo and not a soprano. It's a beautiful classic. I've always loved this piece. Leona does it well, I suppose. It sounds nothing like her. She's completely changed the colouring of her vocal - and that's not just a classical thing, she's covering in weird places and not opening on certain vowels. But her voice is certainly beautiful. Must agree with @guest, though.. Renèe certainly has nothing to worry about. God, now THAT is a beautiful version. Perfect bel canto technique. That woman is godly. I'll be interested to see a) Leona perform this live and b) hear her "classical album" which is apparently her next project. And she is singing in the original key which is meant for lyric soprano or high-mezzo. Considering her voice blooms between Ab4-Ab5, I'm most certain it is a soprano instrument. I prefer traditional/classical christmas music when it comes to that. Well, it's up to you whether you want to check it out but just so you know...It's not "modern Christmas music". There's two songs she wrote but the others are christmas classics. I'm with you re Barbra's christmas album (the 1967 one that is). and that's why she got a recording contract and you didn't?